If you are thinking about becoming a Legal Nurse Consultant, there are several misconceptions that you should know about before making your final decision on a course. Choosing the right Legal Nurse Consulting certification and training program can be a difficult decision for many Nurses. The wrong choice can make Legal Nurse success much more difficult to achieve. Without accurate information, choosing the right path for your Legal Nurse career becomes even more difficult. Unfortunately, most Nurses don’t find out that they chose poorly until after they have spent the money and completed their training. We know this happens because many of those unsatisfied Legal Nurses contact LNC STAT looking for better training, and complain about all the deficiencies in the course they chose first. Hopefully, this article can save you the money and frustration by clearing up some of the common misconceptions, so you can make the right choice the first time. The truth is, accreditations will not determine how successful you will be as a Legal Nurse. Any accreditations that an organization may have is completely unrelated to the quality of their Legal Nurse training and standards. There is no governmentally accepted board for Legal Nurse Consulting, and there is no official Legal Nurse Consulting program. That means, there are no universally accepted standards for Legal Nurse Consulting. Some Legal Nurse Consulting organizations, universities, and colleges like to use a national accreditation to make their Legal Nurse training seem superior to others and official. These claims cause confusion for aspiring Legal Nurses. They are lead to believe that they are choosing the best course, but learn the hard way that the training was incomplete. The truth is, any accreditations an organization claims to have are completely irrelevant to the quality and effectiveness of the Legal Nurse consulting training they offer. Each organization set’s their own standards when it comes to Legal Nurse training and certification. While one organization may require 2000 hours before you can become certified, others may not have the same requirement. The major down side of the 2000 hour requirement is that it conditions Legal Nurses to work in-house. While some Nurses are fine with this, most want to work independently so they can earn more money and have more freedom with their schedule. In-house jobs often don’t pay as well and don’t allow Nurses to spread their wings as much as they may want. After the Legal Nurse works their 2000 hours at an in-house job, they still lack the skills and mentality necessary to successfully practice independently. Additionally, why would you need to pay for a certification or certificate after working 2000 hours? If you already have a Legal Nurse job where you clocked your 2000 hours, there will be no need for a certification since you are already employed. If the desire to branch out and transitioning into your own independent practice is your reason, those 2000 in-house hours still would not show you how to do so. LNC STAT does not need the 2000 hour requirement because its training is more comprehensive and hands-on. You get to practice the essential skills as part of your LNC STAT training, without having to wait 2000 hours. You probably already know how to be a Nurse, so the LNC STAT course focuses on teaching you how to put that nursing expertise to work in another area. Legal Nurse Consulting training is by no means standardized. Each Legal Nurse certification organization offers their own training and they are responsible for enforcing their own standards. This means some courses are better than others when it comes to the curriculum and the quality of the training. For a Legal Nurse to be able to find success, the course they choose should be able to show them how to effectively utilize their medical expertise in the legal field. It should walk them through the transition and focus on areas where nurses have trouble most. An example of this is marketing. The Legal Nurse may be able to complete fantastic reviews and create impressive reports, but if they don’t learn how to market their service effectively, they will not get anywhere as a Legal Nurse. Nurses typically don’t have to market while working in the medical field or while working an in-house Legal Nurse job. Therefore, most nurses are not very good at it when they start Legal Nurse Consulting and need extra help in this area. Even though thousands of Nurses enter the field of Legal Nurse Consulting, most of them never secure their first case, or are able to do anything with their training. This is because their training did not show them exactly what to do to find Legal Nurse success, or they lack the motivation to put their new expertise to work. 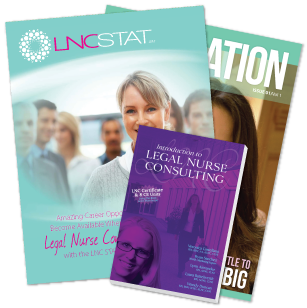 If you have heard that the Legal Nurse market is saturated from someone who is certified as a Legal Nurse, that probably means they did take the LNC STAT course. Just because a Legal Nurse course may seem like the biggest or most popular, does not mean that they offer the most effective training or have the most successful graduates. It probably just means that they spend a lot of money on marketing. The problem with the biggest programs is that they come with big crowds. In these big crowds of nurses wanting to become Legal Nurse Consultants, you probably won’t receive the personalized attention you need, you won’t have all your questions answered, and you may not understand exactly what has to be done to find Legal Nurse success. Even though many well-known and influential universities offer a Legal Nurse Consulting course, most of their graduates are still not able to find Legal Nurse success. Many graduates from these university courses have complained about major deficiencies in their training and lack of personalized attention. No matter what your major may be, most colleges or universities have one major problem: you are usually on your own after you graduate. This shortcoming is no different with their Legal Nurse Consulting courses. Additionally, they lack the ability to provide you with vital resources such as marketing tools, contract templates, and report writing templates. While it may seem to make sense that you should learn Legal Nurse Consulting from an attorney, or take the advice of an attorney, their input about Legal Nurse Consulting is not always accurate. This is true, because while they know law, they usually don’t know medicine, or what it is like to practice from the perspective of the Nurse. They probably have never had to market to another attorney, had to convince another attorney of the value that a Legal Nurse can offer, or had to write a report about medical records. Doesn’t it make sense to learn Legal Nurse Consulting from a currently practicing Legal Nurse, who can show you what she did to find success? That is how LNC STAT was created 15 yeas ago and is still taught.